Here’s what happened in last night’s game. Rosie has gone on ahead to Waterdeep on pressing faction business. Next: the Council of Waterdeep reconvenes. Travelling back to Waterdeep from the Misty Forest, the PCs reach the village of Liam’s Hold. A group of dwarven miners have captured Cheela Flegsteel, a Wearer of Purple in the Cult of the Dragon, and are after a reward from the party. Cheela starts to explain that she is carrying a message for the Council of Waterdeep when Yggran, a half-red dragon veteran, and his ogre minions burst into the village and attack. 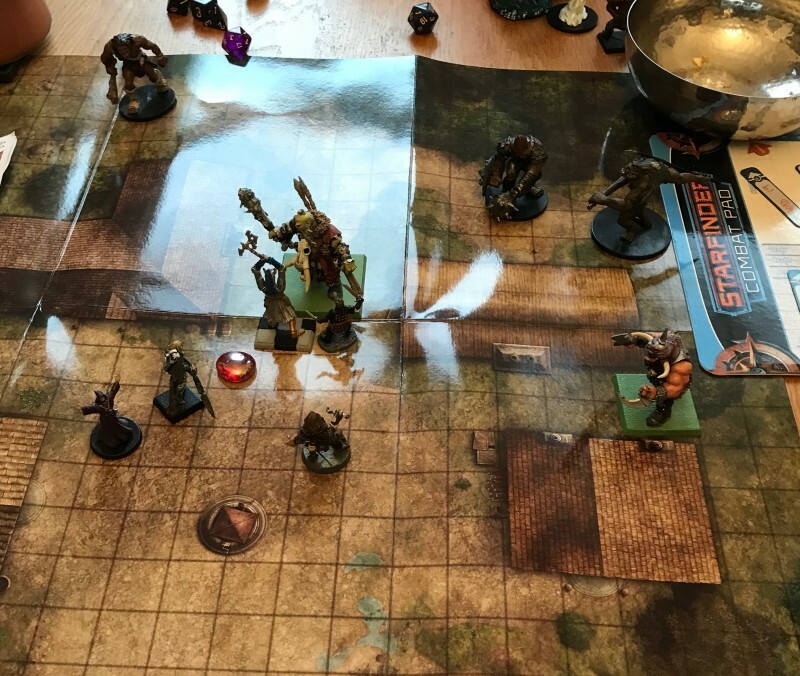 One of the ogres has an abnormally large head and is a spellcaster – he attempts to dominate Gwastdyn, then uses misty step to close to melee. Yggran breathes fire on Cheela and the dwarves, killing four of them. Turin uses banishing smite to send the half-dragon to another plane. Ug and Crake move in to protect Cheela from Big ‘Ead while Gwastdyn summons a pack of wolves to keep the other ogres busy. The paladin kills Big’Ead and the others finish off the ogres and take down Yggran when he reaappears. The PCs interrogate Cheela who claims to work for a mage named Iskander who is in the service of someone called Galvan. The cultist hands the PCs a sealed letter from her master. Crake opens it – against Turin and Gwastdyn's recommendation – as he thinks it is too urgent to wait until reaching Waterdeep to see what it says. The missive promises them the Blue Dragon Mask in return for rescuing him from Xonthal’s Tower. Once home to a legendary wizard who wandered Toril, the tower lies to the northeast of the Serpent Hills and is protected by a hedge maze. The PCs let Cheela go and spend the rest of the day in the village recuperating. The PCs arrive back in Waterdeep and report to Laeral Silverhand on events in the Misty Forest and Liam’s Hold. The Open Lord tells them the Council of Waterdeep will meet again as soon as they return from their meeting with the metallic dragons. Elia assumes her true form, that of the ancient silver dragon Otaaryliakkarnos and the PCs climb onto her back. She flies up into the air and heads northeast towards the Nether Mountains. As they travel, the PCs can see villages and towns destroyed by the Cult of the Dragon far beneath them. They ask Otaaryliakkarnos about the other dragons they will be meeting, and learn that she dislikes dwarves because they hunt dragons in “dragonmoots”. Later that day, Otaaryliakkarnos and the PCs come under attack from two familiar dragons - Arauthator and Chuth. 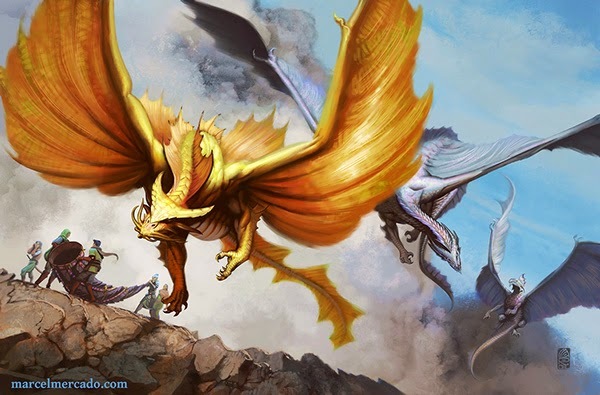 A frantic aerial battle ensues, with the PCs trying to attack while clinging on to the silver dragon’s back – they suffer damage from Chuth’s breath and a fireball from Arauthator. Gwastdyn wildshapes into an air elemental, Crake fire arrows, Turin casts fireballs and a frustrated Ug misses with his guiding bolt. Crake leaps to his feet, balancing on Otaaryliakkarnos’ back and fires an arrow at Chuth which strikes true – badly wounded, the dragon flees from the party for a fifth time! The silver dragon chases after Arauthator whom Gwastdyn has been keeping busy, and hits him with her bite and both claws. This is enough to drive off the white dragon. As night falls, Otaaryliakkarnos lands on a freezing cold peak in the Star Mounts so the PCs can rest in a cave. Otaaryliakkarnos and the PCs arrive at the Council of Dragons and argue their case to the five leaders of the metallic dragons in an attempt to win their support in the war against the Cult of the Dragon. Protanther, King of the Ice, a male gold dragon is the leader of the group. Turin promises to secure a formal apology for the dracorage mythal from King Melandrach of the elves. They give the Black Dragon Mask to Ileuthra, the male brass dragon, and promise the metallic dragons will be given the other dragon masks after the final battle for safekeeping. Gwastdyn promises Otaaryliakkarnos that he will ask Ambassador Brawnanvil to return the armour made from her niece’s hide, and secure an apology from the dwarves for the dragonmoots. Nymmurh, the Wyrm Who Watches, a male bronze, is already favourably disposed to the humanoid races, but the party’s promise to give the metallic dragons a full share in the cult’s treasure is appreciated. Tazmikella, a female copper wants the return of Borngray’s swashbuckler’s rapier, now in Crake’s possession, which was stolen from her hoard. Crake promises to give it back once the cult is defeated. After the council is over, Otaaryliakkarnos flies the PCs back to Waterdeep.